Dieses Hostel liegt sehr zentral keine zwei Minuten vom Platz Monastiraki entfernt. Sehr sauber mit einersuper Dachterrasse mit Blick auf die Akropolis. Die Angestellten sind sehr nett. Kann dieses Hostel nur weiter empfehlen. Das Athenstyle ist sehr praktisch gelegen am Platz Monastraki mit der Metro direkt nach Pireus und zum Flughafen. Außerdem können zu Fuß sehr viele antike Sehenswürdigkeiten besucht werden. Shoppen gehen kann man auch. Und abends ist man mitten in einem quirligen Ausgehviertel (daher ist es nachts aber auch nicht ganz leise vor den Fenstern). Unser „Deluxe Privates Zimmer“ war klein, wirklich klein, aber völlig OK. Die Mitarbeiter sind alle richtig nett, aufmerksam und hilfsbereit. Sehr gute Lage und wundervolle Dachterasse. Schönes Hostel mit großer Dachterrasse. Leider gab es keine Spindschlösser sonst war alles perfekt. Sehr gut sind die großen Gepäckaufbewahrungsmöglichkeiten mit PIN-Code im Keller wenn man sein Gepäck am Abreisetag noch lagern will. Shower/Bath not that clean. Eating own food only in the small and dark kitchen allowed. Very central, friendly staff! 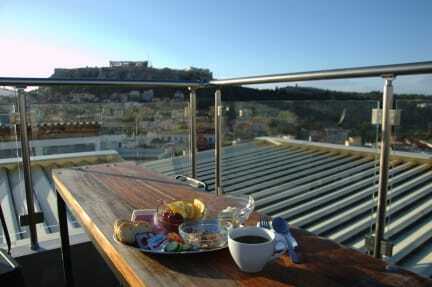 Cool Hostel with the perfect lokation for the city, 5 minutes to the metro, at the foot of akropolis. Staff was really nice. And the rooftop is stunning. The only downside is the inconvenient kitchen opening hours. Wir haben für 50€ pro Person pro Nacht im Twin-Room mehr erwartet. The staff was really friendly. Sadly I could only eat in the small kitchen, where the equipment was very rare (two old pots, two pans, and a few dishes). The sponge and the towel was not changed during the whole week, so it gots really dirty. For me personally was the mattress too soft. They have a lot of extras, like menus,drinks or daytours, so if you like to use these extras, it perfect. I have had a great time ,although I didn't use these extras. We stayed at this hostel for two nights. Except for the really smashing location and the rooftop terrace this place is lacking spirit in every way. Neither the staff nor the equipment of the place was welcoming or exceptionally sympathetic. There was no creativity in the furnishing of the room, nothing individual or appealing, but all very clean though. We cannot recommend this hostel. And certainly we won't go there again.